Elementary school children who took part in a healthy living program with older peers reduced their waist sizes and showed improvements in self-esteem, according to a new Canadian study. In the so-called Healthy Buddies program, students learn about healthy foods, physical activity and positive body image from older kids, rather than adult teachers or coaches. Researchers say the program could potentially reduce rates of childhood obesity. “We recognized that in Manitoba and particularly in our northern regions rates of childhood obesity are fairly high,” Jonathan McGavock told Reuters Health. McGavock, from the University of Manitoba in Winnipeg, co-authored the study that was a collaboration between his university and policymakers in the province of Manitoba. “About one in three children are overweight or obese and in some communities it’s up to one in two, so 50 percent of our youth,” he said. McGavock said previous school-based interventions or afterschool programs hadn’t worked to reduce obesity. “A new model had come out where a group at the University of British Columbia (also in Canada) had developed a peer mentoring program that relied on older peers delivering the healthy living messages to younger peers and it looked like it had worked,” McGavock said. He said early studies of the Healthy Buddies program looked promising, but Manitoba policymakers wanted stronger evidence and to see whether they could disseminate it widely across the province. In the fall of 2009, the researchers enrolled 647 students from 19 elementary schools in Manitoba in their study. Students from 10 schools were randomly selected to receive the Healthy Buddies curriculum and nine were put on a waiting list and served as a control group. About half of the students attended rural schools and 36 percent were overweight or obese. At the start of the study, the researchers measured kids’ waists, calculated their body mass index – a measure of weight relative to height – and assessed the children’s physical activity and fitness levels, self-esteem, knowledge of healthy living and eating habits. Teachers from each of the schools were trained in the program so they could deliver weekly lessons to students nine to 12 years old. Then, the students presented the same lessons to younger “buddies” who were six to eight years old. At the end of the school year, 584 students had completed the program, and the researchers reevaluated them. 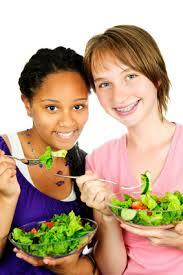 They found the younger kids in the program had lost about three quarters of an inch from their waists, on average. “That’s important because that’s a major risk factor for type 2 diabetes and other chronic diseases,” McGavock said. Older kids’ waists also shrunk, but the effect was smaller, and potentially due to chance. On the other hand, the benefit was larger for overweight and obese kids, according to the findings published in JAMA Pediatrics. There was no change in waist size among kids in the comparison group. The researchers found that kids who participated in the Healthy Buddies program also showed positive changes in their self-esteem. “The program was particularly effective in overweight youth and in our First Nations or indigenous youth, and they’re the ones who we’re the most worried about,” McGavock said. “So overall if we had to send a message to parents and policymakers, it is that this works in the kids we want it to work in, it builds their confidence, and as a result, it potentially could lower the rates of childhood obesity,” he said. The program did not lead to changes in body mass index, exercise or fitness, however. McGavock said Healthy Buddies is sustainable and fairly low-cost because it doesn’t rely on expensive teacher time – kids deliver it to kids – and it can be built into the curriculum. “It’s really difficult to make changes in the school environment where there are so many moving parts and competing interests,” Dr. Stephen Pont told Reuters Health. “This study shows that it is possible to engage schools and then to demonstrate improved health in kids,” said Pont, who wasn’t involved in the new research. He works at Dell Children’s Medical Center of Central Texas in Austin and is chair of the American Academy of Pediatrics Provisional Section on Obesity. Pont said that engaging older students as mentors and leaders is a good approach. “When kids teach other kids how to be healthier they are more likely to continue to practice healthier lifestyles themselves,” he said. More schools are realizing that healthier students do better academically and also miss less class, he added. “As more studies are published showing the positive link between better health and academic success, more schools will realize that through embracing initiatives to improve the health of their students they will also improve their academic outcomes,” Pont said.